The CPH Village project is taking sustainable student housing to a whole new level. 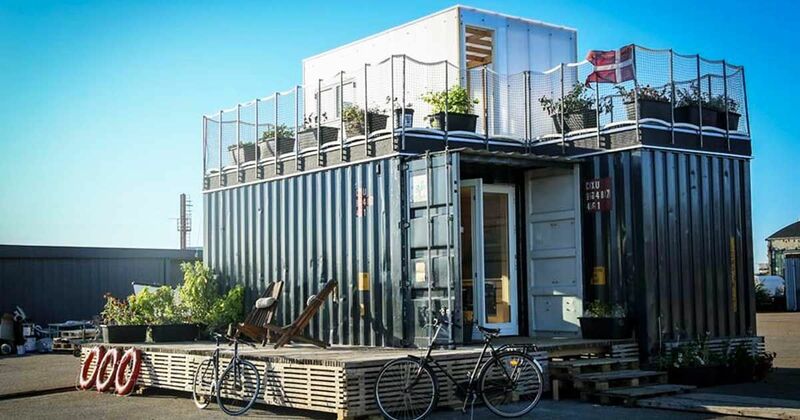 Hailing from the harbors of Copenhagen, Denmark, these container-based dwellings are being installed to curb the constant shortage of student accommodation in major cities across the globe. Their very first settlement is almost ready for launch - and we're just itching to take a good glance at what to expect from this ambitious endeavor. How cool is that? The exteriors are made with your standard 40-foot (12.19-meter) shipping containers, all spruced up to include a lower deck and upper terrace. As you can see, there are two entryways to this container home. This end of the dwelling ups the ante by getting quite generous with its windows. The open-plan interiors greet all visitors with its matte wooden finish. Quite a contrast to the house's outer metallic aesthetics, don't you think? The kitchen prioritizes efficiency: All your shelves, appliances and cupboards have been fitted in an orderly, wall-to-wall fashion. With so much space on show, the minimally-furnished dining area can easily be turned into an entertaining living space. Wall-mounted shelves ensure the CPH Village pods are clear of clutter. A cozy sleeping area is tucked in the corner, right next to some of the best views of the house. Divert your attention to the other side of this nifty abode to find a spacious bathroom complete with full-size shower, toilet, and sink. Imagine living in a commune with such great container houses? Efficient, minimalist and nicely furnished, The CPH Village's signature design definitely appeals to our tiny living affinities.